Ty Beanie Baby Babies Timeline! A look at Ty's most memorable Events! 1986 was the birth-year of Ty, Inc. Ty, Inc. was established in Oak Brook, Illinois. Ty Warner who had previously worked for a toy plush manufacturer called Dakin was already a toy selling pro, his first line of plush to be released where 4 Himalayan cats named Smokey, Ginger, Peaches and Angel. In 1991 Ty launched a line called "Annual Collectible Bears." These made Ty quite successful and well known as a plush manufacturer. During this year Ty also began branching his company to England, Canada and Europe. Some older Ty products still say "Deutschland, Nuernberg" inside of their hang tags. This location has since been closed though. Seven years after Ty, Inc. was founded Ty releases his first Beanie Baby creations Brownie and Punchers in early 1993. During the later half of the year Ty released the Original Nine beanies, Legs the Frog, Squealer the Pig, Brownie the Bear ( later renamed to Cubbie the Bear) , Flash the Dolphin, Splash the Whale, Patti the Platypus, Chocolate the Moose, Spot the Dog and Pinchers the Lobster at the New York Toy Fair. Beanie Babies are starting to become known as a collectable and not just a toy throughout the Chicago area. Since the introduction - of the Original Nine more than 3 dozen other Beanie Babies have been added to the collection. Ty sells Beanie Babies directly to small specialty gift shops, avoiding the loss of control and costs of selling through a wholesaler. Beanies sporting a new hang tag are now seen, this will become known as the 2nd generation hang tag. Beanie Babies go nation wide! Stores outside of the Chicago area are now able to order Beanie Babies. This leads to the introduction of the 3rd generation hang tag. Ty only sells his plush to small collectables and gift stores. This will later prove to be a large part of why they are so successful selling. Just when some experts thought the beanie 'fad' would fade after the Christmas of '95, sales grew tenfold! Stores had problems keeping beanies stocked and Ty had problems getting beanies to stores on time. It was said that Ty leased three airliners to rush a special shipment from overseas to the stores in time for Easter. Time for Ty to step into cyberspace... After some legal battles regarding the ownership of the web address www.ty.com , Ty launches the grand opening of his website. This will become the only portal the outside has into the world of Ty. People will start to use the website to trade beanies with other collectors around the world. This is also the first time Ty shows some form of advertising for his company. Prior to this Ty advertised nowhere! Popularity of his product spread through the media and word of mouth, something that will make Ty famous! 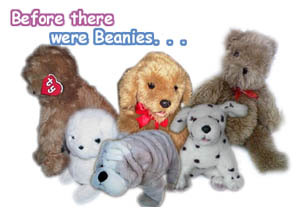 With the development of the website, Beanie Baby retirements are now officially announced on the side, prior to the website they were simply removed from the retailers ordering form and no longer made. These strategies lead Ty to make a profit of $250 million dollars during 1996 alone. This year is also the release of the first exclusive Beanie Baby, Maple the Canadian bear is released in Canada where only Canadian retailers are able to order them. This leads to the introduction of the 4th generation hang tags as well. Ty does his first interview with People Magazine and another later in the year with Forbes Magazine. Beanies are the latest and greatest craze right now. To add fuel to the fire Ty and McDonald's partner up this year to start the biggest Happy Meal promotion of all time. Miniature Beanie Babies called Teenie Beanies are given away with Happy Meals! McDonald's around the nation are flooded with crazed fans in search of each Teenie Beanie. People must have had freezers full of McDonald's Happy Meals that year! This same year the first Sports Promo Beanie is announced. 10,000 Cubbie Bear beanies are given away to children at a Chicago Cubs game. Ty himself threw the first pitch at the game. Ty also gives his employees a special bear exclusive to them called "1997 Employee Bear." For sure one of the rarest bears today. This year the 5th generation hang tag is also released. Also Britannia the first European exclusive bear is introduced while in the mean time Ty is conquering the German market. A second McDonald's Teenie Beanie promotion is done, this time they sell 250 million Teenie Beanies. Ty's sales exceed I Billion dollars now making him the most successful toy manufacture in the world. Ty also gives his employees another exclusive beanie, each employee received 2 Billionaire Bear Beanie Babies. This same year he gave each Ty Representative a #1 Bear exclusive to them. Each of these bears still fetches a pretty penny on today's market. This year Ty also launches the first Beanie Baby for charity. Princess, royal purple bear with a rose is released to remember Princess Diana and to raise money for the Princess Di Foundation. Ty donates 10 million dollars from the proceeds of Princess beanie sales. Germany gets their first exclusive called Germania. This year also holds the newest tush tag releases. These new high tech tags now sport holograms and a special ink to help crack down on counterfeiters. Germany's McDonald's along with USA McDonald's launch a promotion of Teenie Beanies this year. Ty gives another employee exclusive bear called Billionaire II out. Ty bought New York Cities tallest hotel, the New York City's Four Seasons Hotel for $275 million. The BBOC, Beanie Babies Official Club is created. Ty does an interview with USA Today. But the most memorable thing from Ty this year is the announcement Ty made that he would be retiring all Beanie Babies at the end of the year. A bear named "The End" is released and adds to the excitement. At the end of the year Ty lets the collectors of the world decide the fate of Beanie Babies. He also collects a small fee from each person who voted and donates the money to charity. Of course collectors all over agree that Ty should continue with the Beanie Baby line! Ty introduces new lines, including Beanie Kids at the New York Toy fair this year. A Germania Buddy is also introduced, Japan receives an exclusive called Sakura and the USA receives an exclusive called USA Bear. Ty creates Issy another charity bear, collectors go wild for Issy because there are now 63 different versions! On April 14, 2001 Ty announces the People's Beanie competition! Collectors vote of who will be the next Beanie and what it will look like! Click here for more information! Ty announces their partnership with MBNA MasterCard to give away a free beanie when you apply for the card! On September 13, 2001 Ty announced America the first in a series of charity bears to raise funds for those effected by the terrible terrorist events of September 11, 2001. Ty Warner signed an America Bear and put it up for auction on Ebay.com where it sold for $24, 000! In January Ty announces a Ty sponsors Beanie magazine called Mary Beth's Beanies & More, this new magazine now contains no ads!